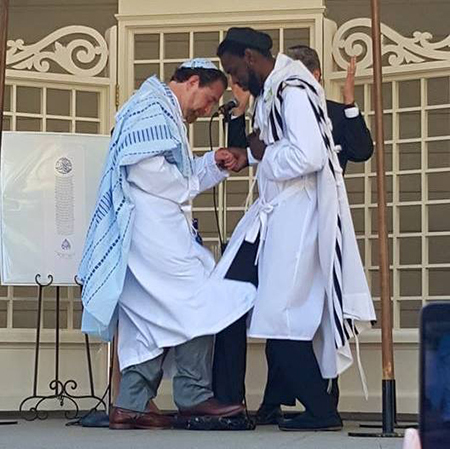 On Shabbat, Chaim Respes, a 38-year-old human resources manager active in his New Jersey synagogue, dons a kippah and drapes a tallit over his shoulders. He enjoys attending services with his wife, a Jew-by-choice, and their three young boys. As one of the instructors in the congregation’s religious school and the recently ‘retired’ volunteer director of its youth programs, Chaim is a familiar presence, his picture visible on flyers in the lobby. 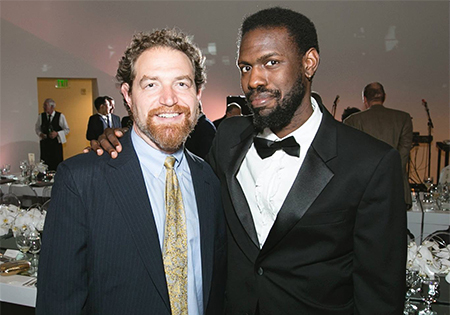 As a strapping African American male (6’ 4”), Chaim unwittingly feeds the perception that he is not ‘Jewish like us.’ It’s a perspective perhaps understandable, if not forgivable, in a society of “white privilege,” as Rabbi Menachem Creditor, spiritual leader of Berkeley’s Congregation Netivot Shalom, calls it. Rabbi Creditor addressed the issue in a recent Facebook post in response to a similar incident in his shul. A black woman, a long-time active member and Shabbat regular, had been asked if she was part of the catering staff, and was complimented for the day’s chair arrangement. “Just be humble, stay awake and show up,” he says. In a number of conversations we had about the experience of being black or bi-racial and Jewish in the era of Black Lives Matter, we heard a disturbing refrain. More than concerns over personal safety, which are real; more than the struggle with maintaining a strong Jewish identity while nurturing ties to one’s black or multi-ethnic/racial heritage, challenging as that can be; more than random, threatening run-ins with law enforcement, though not uncommon; many articulated the pain and trauma of alienation from places they consider home and from people that should treat them as family. Jackson’s personal early experience in synagogue life was traumatic. Attitudes were so racist in his South Jersey congregation, he recalled, from the rabbi on down, that his family dropped its membership after he attended only one year of Hebrew school. By the time his year-old son is old enough for formal Jewish education, Jackson hopes the landscape will be different, but he retains a healthy skepticism based on realities he still runs into when he enters some Jewish spaces. Yet, others do describe positive experiences within their synagogues. For one Bay Area couple, Netivot Shalom epitomized a warm, embracing community when they trans-racially adopted and converted their son, Avi, 23 years ago and raised him strongly engaged in Conservative Jewish life. “There are lots of families that look like us in our community,” said Rom Rosenblum. The Rosenblums attended Shabbat services weekly, and Avi developed an unshakeable feeling of belonging as an Ashkenazi Jew and a Zionist, said his father. 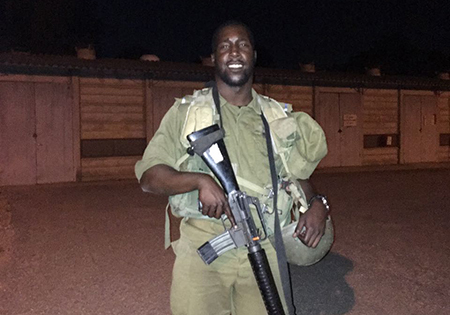 Now, when congregants visit Israel, they look up Avi, who made aliyah in 2014 and is now in the army. 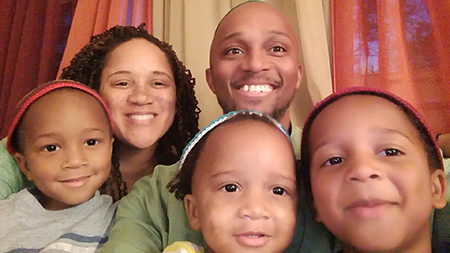 Rachel Weitzner, of Baltimore, is the mother of three girls, 5, 3 and 19 months, with her African American hus-band, Greg Terry, who was in the process of converting when the two met. A nurse, Greg was a BBYO advisor for 10 years, beginning as soon as his conversion was completed. The couple feels fortunate to have a truly diverse, welcomng Jewish community at Congregation Beth Am in downtown Baltimore, where Rachel works in development. Shabbat-observant, the family bought a house with a 90-year-old mezuzah on the front door, within walking distance of the shul. Their oldest attends the area’s Solomon Schechter Day School and Jewish day camp. The neighborhood, historically Jewish, is now racially and socio-economically diverse, not far from where the unrest occurred surrounding the shooting death of Freddie Gray in the spring of 2015. Mike Rothbaum and Anthony Russell at their wedding. In the final analysis, what has kept and keeps black and biracial Jews grounded in their Jewish identities and connected to Jewish community, regardless of biases and alienation and the sometimes misguided attempts by congregants to be welcoming? “We subscribe to the Jewish value that people are valued regardless of their race or religion,” said Rachel Weitzner. Others pointed to messages embedded in Jewish law and tradition strongly communicated in their homes, promoting social justice and treating all human beings with dignity and respect. Not surprisingly, these same Jewish values are what fuel and strengthen their racial identities, steering their moral and ethical compasses and helping balance competing racial-religious claims on their time and attention. Hopefully these values will set a positive course for the future in making diversity and inclusion in Jewish communities more reality than myth. “Being Jewish is a process,” observed JIAH’s Jared Jackson. “But so is being human. We all have an expiration date, but it’s exciting to see people go through processes and observe the shifts. You don’t have to end life as it began, with negative biases, in order to preserve what you had as a child or to preserve parts of what you are. HOW MANY AMERICAN JEWS ARE JEWS OF COLOR? Determining how many Jews of color there are in the United States, regardless of movement affiliation, is itself a challenge. According to the 2014 Pew Center Religious Landscape Study, only two percent of Americans who identify as Jewish are black, with another two percent of mixed race or ethnicity (but not Asian or Latino). On the other hand, 64 percent of American whites, 12 percent of blacks, and 4 percent of mixed race individuals claim no religious affiliation, but may well be people born Jewish, according to Jewish law, or have at least one Jewish parent.